If you can somehow avoid the height of summer and visit the country’s finest scenery in the spring (National Parks Week is in April), fall or winter (when several free entrance days are offered), you’ll be seeing these scenic spots the way pioneers did, practically alone in a private playground. Even if you have to face the crowds at peak season, however, you can still take a good hike, far removed from the masses. Plan a trip to one of these amazing national parks (listed in no particular order) with your family now! There's a reason renowned photographer Ansel Adams made Yosemite his most famous subject. It's hard not to be mesmerized by Yosemite's striking and varied landscape, from the granite cliffs and domes -- including the legendary El Cap, a rite of passage for the top rock climbers in the world -- to the colorful wildflowers that fill Tuolumne Meadows and the rushing rapids of the Merced River. Kids will never forget the opportunity to stand next to 200-foot-high sequoias in Mariposa Grove, shadowed by these immense trees and their shaggy orange bark. Before hiking Upper Yosemite Falls for the day, kids can sign up to become a Junior Ranger (ages 7 to 13) or Little Cub (ages 3 to 6), with the purchase of a special booklet ($3 to $3.50), to be completed upon your visit. Remember that Yosemite is a four-season getaway, too. While the roads are crowded in the summer, come December, Yosemite is a tranquil winter wonderland. Snowshoe to the sequoias, cross-country ski on groomed track to 7,000-foot-high Glacier Point, ice skate under the cliffs of Half Dome and go skiing at one of the oldest ski areas in California, Badger Pass. Most families make the mistake of driving to Grand Canyon National Park, taking a peek down at the mile-deep canyon and then leaving. 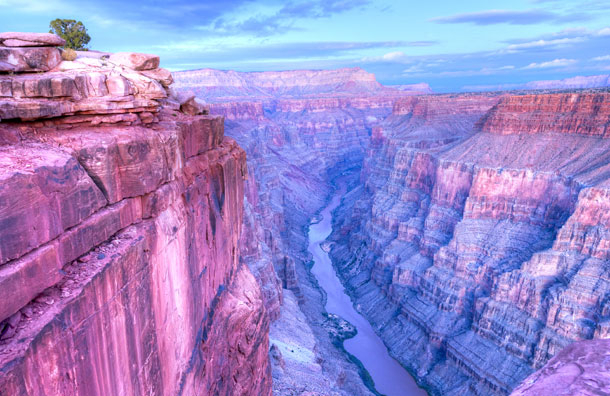 To truly appreciate the Grand Canyon, you need to spend some time walking into that big hole. For starters, try the 1.5-mile South Kaibab Trail down to Cedar Ridge, which rewards you with exquisite views of the inner canyon as you smell the sweet pinyon pine. For something completely different, try the mule ride down the Bright Angel Trail (but book well in advance of your trip). Summer temps can be hot, especially by the Colorado River, which is significantly warmer than the rim. If you can delay your trip until September or October, temperatures dip to a comfortable high of 65 to 75 degrees. An added bonus is that these are the drier months. Before you go, check out Sesame Street Explores National Parks (available on the park's website) -- six short videos and hands-on activities with Elmo and Murray, perfect for preparing your pre-schooler or young child before they venture into the famous park. Like the Grand Canyon, Utah's Bryce Canyon is one of the few national parks in which you look down in awe, instead of up at mountains and cliffs. 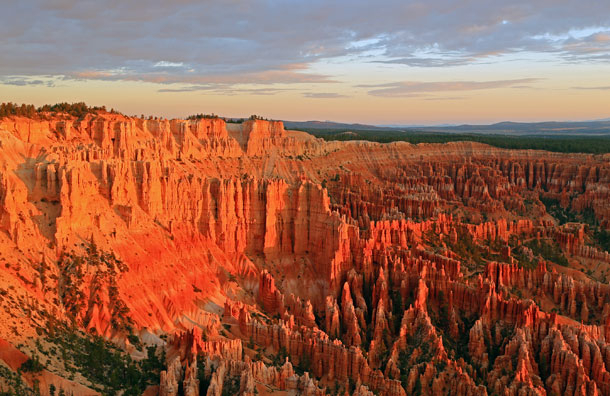 Here, the highlight is the hundreds of hoodoos, colorful standing pinnacles that line the Bryce amphitheater. Inspiration Point is a good name for the peach, apricot, tan, white and red rocks that stand at attention like people on a parade route. To get a closer look, stroll down the Queen's Garden Route, a dusty stone path loaded with those "Hoodoo Dudes." Summer is actually a good time to hit Bryce. Unlike other areas of southern Utah that are sweltering in July and August, Bryce's elevation of 8,000 to 9,000 feet keeps the park relatively cool. If you want to take the family on a remote hike, try the 4.5-mile long Sheep Creek/Swamp Canyon Loop in Bryce's backcountry. If walking the trails sounds too exhausting for your kids, try one of the Trail Rides on mule or horseback! Located in southeastern Utah near the Colorado border, Arches is one of the smallest and most inviting of all the National Parks. It's also one of the most breathtakingly beautiful. Walk the sandy trails and you'll find astounding stone arches and rock formations more spectacular than the last. The park notes that it has more than 2,000 arches in all. Families with small kids should take the easy walk to Sand Dune Arch as a warm-up, where a large sand pit under the arch is the ideal natural sandbox. Then try the 1.6-mile (round-trip) hike to the long sliver of arch called Landscape. The Delicate Arch Trail is for older kids only, on a somewhat steep and slippery route that is favored by long lizards. Arches is near Moab, one of the nation's best mountain biking hubs, if you want to do some riding outside of the park. 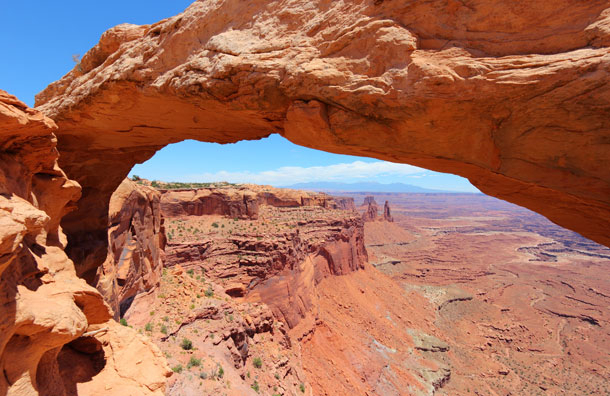 Nearby is Canyonlands National Park, which kids may prefer over the Grand Canyon. Instead of summertime crowds and canyon expanses so wide they are difficult to grasp, Canyonlands provides beautiful canyons and hikes that get you as close to the edge as you can handle. If you are visiting Arches, don"t pass up Canyonlands. Rocky Mountain National Park is celebrating its 100th anniversary in 2015. With more than 300 miles of trails, all you have to do is hike a mile in from the road and you'll be savoring the carpet of trees. 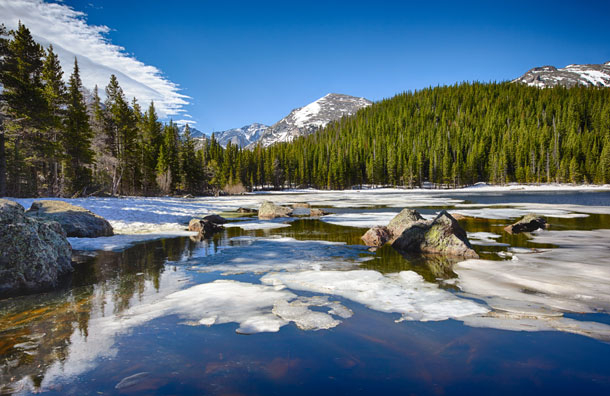 With a mind-boggling 71 peaks topping 12,000 feet, Rocky Mountain National Park also has more than enough space to accommodate all those bighorn sheep, mountain goats, elk, moose and fuzzy marmots that call this parcel of Rocky Mountain National Park home. You can find many of the big animals at a mineral lick near Sheep Lake at Horseshoe Park. Afterwards, hike down the Old Ute Trail for good vistas of the 14,255-foot flat summit of Longs Peak. Another good day hike for the family is on the Colorado River Trail, a perfect blend of water, trees and mountains. 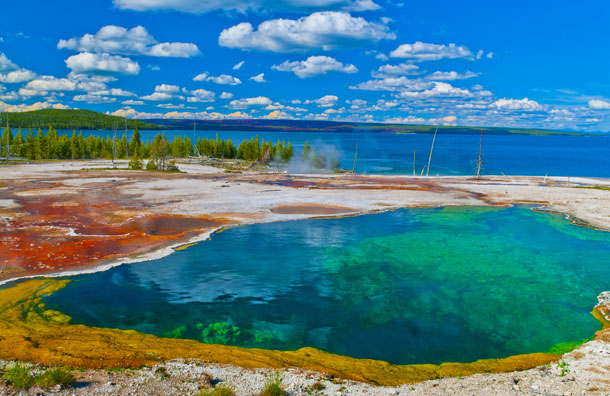 On the Wyoming-Montana border, Yellowstone is the country's first and arguably finest national park. One day, you're watching the eruption of Old Faithful, just one of the geysers that makes up the world's largest collection of them at the park. The next day, you're going eyeball to eyeball with buffalo, elk and moose. Make sure you get out of the car and off the popular loop road. It's better to spend your day in the Hayden Valley, a favorite wildlife hangout far away from the road. If you like to fish, you can throw out your line for trout in some of the clearest waters you'll ever see. Kids ages 5 and up can become Young Scientists at Yellowstone through the hands-on, interactive activity booklet available for just $5 at the visitors' center. Once completed, kids receive a cool souvenir! "I would never have been President if it had not been for my experiences in North Dakota," Theodore Roosevelt once said while reflecting on the influences of his life. 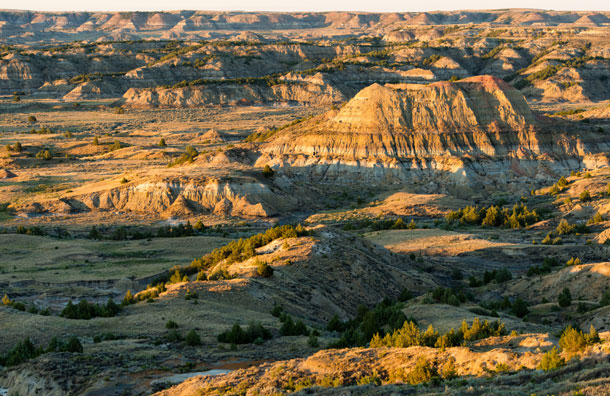 The prospect of big game hunting had initially lured Roosevelt to the Badlands in September 1883. Yet, when he arrived, the last large herds of bison were gone, having been decimated by hide hunters and disease. Today, the mighty bison once again roam the Great Plains. And Roosevelt would be happy to know the North Dakota national park that bears his name is home to one of the largest herds. Some 400 of these 2,000-pound creatures roam the North and South Units of the park amidst a maze of buttes and canyons. Other wildlife includes horses, elk and cute prairie dogs that pop out of their holes like bread in a toaster. One of the most popular ways to traverse the South Unit of the park is the way Roosevelt traveled, on horseback. You can also canoe a stretch of the 17-mile Little Missouri River. Theodore Roosevelt National Park also offers Badlands Club for kids of all ages. Prior to exploring the park, they're encouraged to grab an activity sheet from a ranger and complete special tasks to earn a badge! 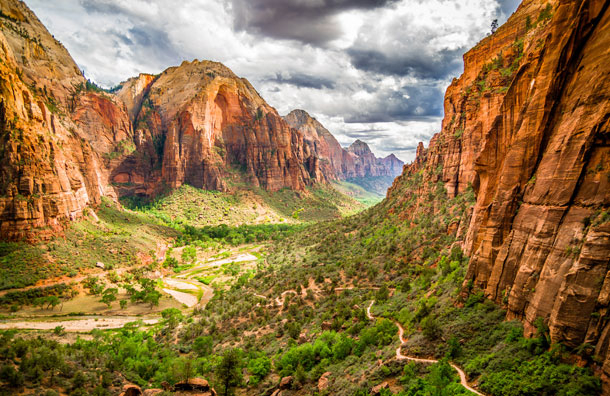 One of the most popular parks -- and with very good reason -- is Zion National Park in southern Utah. During the summer, the park is nearly impossible to navigate by car, and visitors must ride shuttles to the park"s popular trails and vistas to attempt to manage traffic. But is Zion ever worth it! (During the off-peak, Zion Canyon Scenic Drive is open to cars.) While the three small Emerald Pools are a hotspot, the park has a number of swimming holes that are off the beaten path -- just ask the locals how to find one and enjoy the quiet and calm, as well as the true beauty of Zion. If traveling with more adventurous teens, wear waterproof gear and hit the Narrows, a 16-mile gorge along the Virgin River. It may be challenging, but the views from the bottom of the gorge, which narrows to 20 feet, will leave you wanting to return to Zion again. Hemmed in by mountains on either side and bisected by a river, Shenandoah National Park is an idyllic mix of water, valley and peaks. 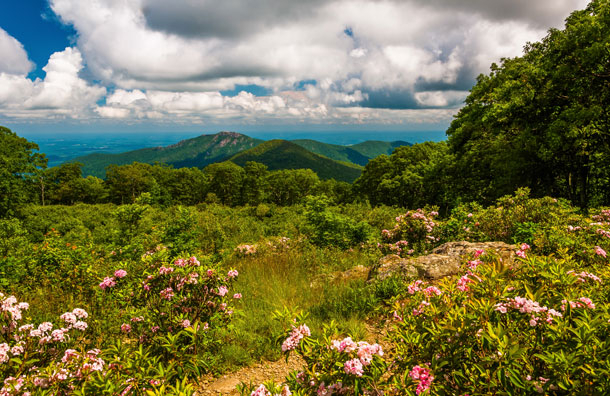 The 105-mile-long Skyline Drive rides atop the spine of the Blue Ridge Mountains, and leads to many of the park's noted hikes. Try the White Oak Canyon Trail, a 5-mile trek that snakes through high hemlocks into a deep gorge that's home to six waterfalls. Alternatively, head down in the valley to paddle past farmland and forested slopes on the Shenandoah River. Fall is even more popular than summer at Shenandoah. Travel there in the spring, however, and the weather's a bit cooler, the wildflowers are starting to bloom, and it's much more peaceful. If you crave solitude (and have teenagers in tow), try one of the more challenging day hikes in the park, Little Devil's Staircase, known for its lost-in-the-woods appeal. No matter where you trek, 200,000 acres will offer vast views with the sounds of deer and songbirds. Like many National Parks, Shenandoah also offers a Junior Ranger program. Kids between ages 7 and 12 can sign up for a 1.5-hour class in which they learn about the park and its environment; programs are offered in the spring, summer and fall. Teens can become Ranger Explorers by picking up the Activity Guide before their next hike through the park, too. Geared toward kids ages 13 and older, this program focuses on the different trails and sights throughout the park. With the highest mountains on the Atlantic coast north of Brazil, slicing fjords, deserted offshore islands and 41 miles of rugged shoreline, it's easy to understand how Acadia became the sole national park in the northeast. Acadia's dense forests and small rambling peaks are located primarily on Maine's Mount Desert Island. Bike on the carriage paths, hard-packed gravel trails, around the shores of Eagle Lake, under tall firs and over century-old stone bridges. A drive to the summit of 1,532-foot Cadillac Mountain rewards you with views across the Atlantic and the lobstermen picking up their catch. Head to Acadia during fall foliage and the maples on Mount Desert Island turn red, orange and yellow. An added bonus is that the black flies and mosquitoes are a distant memory. The best foliage is found on the North and South Bubble trails, off the Park Loop, and the Amphitheater Loop, a carriage path trail close to the town of Northeast Harbor. On your way down Cadillac Mountain, stop at Pink Sand Beach -- the water's cold but the area is breathtakingly beautiful and perfect for some afternoon relaxation. Plus, there are shower and bathroom facilities nearby. 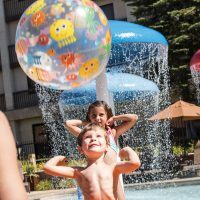 Another perk for families: Acadia Quest. Sign your family up as a team prior to your visit, and complete activities throughout the park.